Elizabeth appeared most recently on Highlight Show 27 as well as on Show 91 recorded in 2003 at age 17. Principal Oboe Elizabeth Koch Tiscione joined the Atlanta Symphony Orchestra (ASO) at the beginning of the 2007-2008 season. She currently holds the George M. and Corrie Hoyt Brown Chair. In addition to her responsibilities with the ASO, Ms. Tiscione plays Principal Oboe at the Grand Teton Music Festival and is a member of the Atlanta Chamber Players. She has performed as a guest musician with the orchestras of Philadelphia, St. Louis, St. Paul, Baltimore, Rochester, Buffalo, and the Orpheus Chamber Orchestra. Recent solo engagements include the World Youth Symphony Orchestra, Orpheus Chamber Orchestra, Atlanta Symphony, and Dekalb Symphony Orchestra. She has been featured on NPR’s “From the Top,” and has also performed at many chamber music festivals throughout the country, including Tannery Pond, Cape Cod, and the Chamber Music Society of Lincoln Center. Ms. Tiscione has a love for teaching, and is currently a faculty member at Kennesaw State University. She also teaches internationally at Festicamara, in Medellin, Colombia, and has a studio in Atlanta. 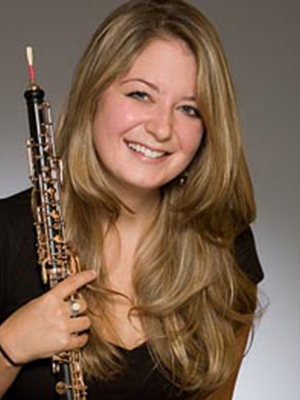 A native of Hamburg, NY, Ms. Tiscione began the oboe in the NY State public school systems at age nine, continued her studies at the Interlochen Arts Academy under Daniel Stolper, and went on to study with Richard Woodhams at the Curtis Institute of Music. Other teachers include Mark DuBois, J. Bud Roach, Pierre Roy, Robert Walters, and Eugene Izatov.